Preheat oven to 350ºF. Lightly coat two baking sheets with nonstick cooking spray; set aside. In a large bowl, stir together banana, peanut butter, honey, and vanilla. In a small bowl, combine oats, cereal, milk powder, cinnamon, and baking soda. Stir the oat mixture into the banana mixture until combined. 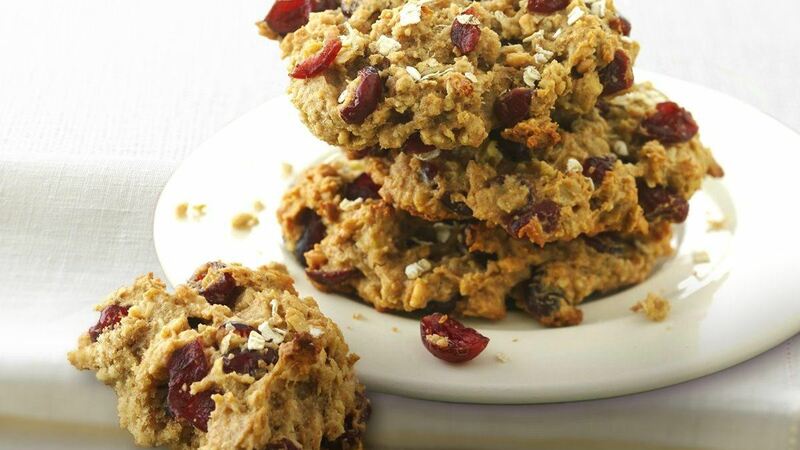 Stir in dried cranberries. Using a 1/4-cup measure, drop mounds of dough 3 inches apart on prepared cookie sheets. With a thin metal or small plastic spatula dipped in water, flatten and spread each mound of dough to a 2 3/4-inch round, about 1/2 inch thick.